Turning up for the Kolkata Knight Riders in the 2018 edition, Rana managed to be the 'out of syllabus' bowler for the RCB batsmen. 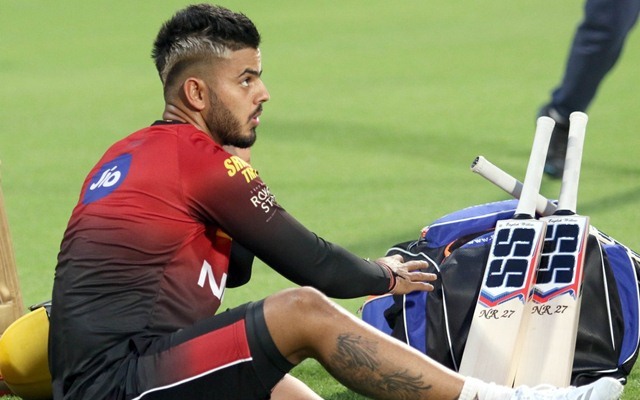 Young Delhi batsman Nitish Rana stunned the Royal Challengers Bangalore in the first game that he played for his new IPL franchise. Turning up for the Kolkata Knight Riders in the 2018 edition, Rana managed to be the ‘out of syllabus’ bowler for the RCB batsmen. KKR beat RCB in the match. Earlier, the RCB team had started getting a strong hold on the game when Rana was introduced in to the bowling attack. It was the 15th over of the RCB innings and AB de Villiers looked in a threatening form. The commentators, be it the regional ones or the English ones, were surprised to see Dinesh Karthik bringing in Nitish Rana to bowl. In fact, Michael Clarke and Kevin Pietersen even joked in the comm box at the prospect of AB de Villiers hitting six sixes in the other. The Proteas batsman hit one on the very first ball and the claims of the commentators seemed to be coming true. However, on the very next delivery, Rana managed to get a top edge off the bat of AB de Villiers and sent him packing. On the very next delivery, he went through the defenses of the RCB skipper, Virat Kohli, to shatter the stumps. The happiness of the KKR camp and the fans at Eden Gardens knew no bounds. The commentators were stunned too. In fact, when Nitish Rana dismissed Kohli, he was seen mouthing some expletives too. While many thought that Virat Kohli might not like such actions of a rookie, the Indian captain has in fact gone on to do something else. Apparently, Virat gifted a bat to Nitish after the game was done and dusted. Nitish took to his social media handle to thank Virat for the lovely gift. Both Nitish and Virat hail from the same city, New Delhi. “When you are appreciated by one of the greats of the game, you know you are doing something right. Thanks for this bat, @virat.kohli Bhaiya this was just the encouragement I needed. #blessed,” Nitish Rana captioned the picture that he posted. When you are appreciated by one of the greats of the game, you know you are doing something right. Thanks for this bat, @virat.kohli Bhaiya this was just the encouragement I needed. #blessed ? ?